Injustice, a video game tie-in series that secretly became DC Comic’s wildest, greatest take on an evil Superman, has finally come to a close. As the last chapters have gone live this week, we sat down with series writer Brian Buccellato to discuss his time on Injustice, and where the comic’s universe could go next. Just a warning, before we go in—if you’re not caught up with Injustice, there’s a few moments discussed in this interview you might want to avoid! io9: You came to Injustice after Tom Taylor had done the first two-and-a-half years, roughly, of the five-year story, and have since been barreling toward the state of the world that we see in the Injustice game. How much of a challenge was it to carve out your own piece of this universe between those two different world-states? Brian Buccellato: I think the hardest part was really just getting up to speed on both ends of the story. It’s interesting that there were volumes of material that came before me, and of course, the game itself is after me. So I think it was mostly just about getting my understanding of the world and the stakes and the balls in the air—and getting a handle on all of that. Once that happened, writers find creative ways to do things. So I just tried to stay true to the game and to Tom Taylor. Tom had this big voice, and I have my own voice. So, I wasn’t trying to do Tom, I just wanted it to be in the spirit of the types of stories he was telling. He was very, you know... heartfelt, character first, lots of people getting interesting match-ups. And some humor. So those are the things I pulled from Tom, and, of course, with regard to the video game, it was just getting all the stuff lined up in a row at the end of it all. Now that you’ve been doing it for awhile, do you find yourself writing differently when writing a digital first comic? Buccellato: Yes, and there’s a very practical reason for that. The digital first comics have an imaginary line through the page, and that’s how they separate—that’s how they get the 11-by-17 paper to work on a screen. So there are no big splash pages. There are no double-page spreads. The sorts of things that you’re used to in the normal print comic book, you can’t do in a digital first. So that’s out. The one advantage you do get is that you’re doing more panels than you would in a normal book, because the artist has to do a minimal of two panels per page, and the pages look better if there’s at least two or three panels on it. I think you get to tell more story. It’s harder for the artist! [laughs] Honestly. But I think from my standpoint, there are more opportunities. You can squeeze more bang-for-your-buck in a digital first comic. 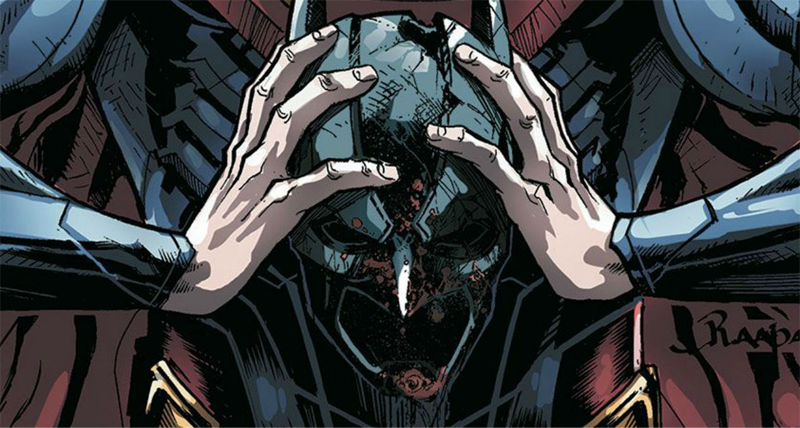 The characters of the Injustice universe have all been changed in significant ways, compared to what the reader would find in any other DC comic at the moment. Who was the most challenging for you to write in that regard? Buccellato: I think the most challenging—this may sound like a cop out—the most challenging was just writing all of the characters. It’s hard to give them all their due. So guys like, you know, Flash, and Green Lantern and Cyborg—and Wonder Woman to a lesser extent. I had a hard time giving them as much comic time, or “screen time” as they deserved. But that was the biggest challenge. As far as the most fun and rewarding, you know, writing a darker Superman was really interesting. Seeing him go from a guy who never did anything wrong to commit murder to commit mass murder—it was a slow process across the five years. It was really rewarding to pick up where Tom left off with that. One of the things I loved most about the series, like you said, is you get to spend just a great length of time with these characters. Evil Superman has been done time and time again, it’s not a new idea—but it’s not one you ever get to experience over an extended period of time. Buccellato: Yeah. I think even you saying that—I feel like there wasn’t enough time for some characters! Obviously, I think I could have written the book for, like, two more years to just sort of focus on everybody. DC has just a rich universe with so many characters across 75 years that you can only fit so much into it. So I’m glad you feel you get to spend a lot of time with the characters. Because I’m always fighting the fact that you can’t tell this person’s story, or if we give them enough of their due. Injustice has had free reign to cover any aspect of the DC pantheon—what’s been your favorite aspect of DC’s lore that you had the chance to explore? Buccellato: Well, honestly, getting to create my own versions of the Greek gods was the most fun in terms of creating something new. I think in terms most of the rest of the DC characters, I tried to keep the spirit of who they are. I didn’t want them not to seem like the characters they are. I tried not to make them too different. That said, it is difficult, because I often question why a guy like Barry Allen would be on the side of Superman, you know? Even though we know in the game, he is. So I tried to at least show some subtly in regards to characterization for these guys and their choices. As you got closer to the end of the series and the events of the first Injustice game, have you had any input from the game’s creators about how it all ties into where the game started? Buccellato: Honestly, that was more on the side of editorial— Jim Chadwick, who was my editor on Injustice. He was in dialogue with the folks at [game studio] NetherRealm, and I know that they saw my outline at the beginning of the year. Every year, I wrote an outline for what the year was going to be about, and they signed off on those. I think that occasionally they’ll weigh in here and there, but for the most part we were left to our own devices. In a series like this, there’s going to be casualties. Has there been a specific moment you felt was the most emotional, or most upsetting to write? Buccellato: I mean, the biggest challenge for me in doing one of the hero deaths was Alfred, by far and away. He’s obviously super beloved, and no one wants to see Alfred die. But I feel I had a reason—a story reason—that made a lot of sense to explore his death and how that would effect the Bat Family, specifically Bruce. His whole fight against Superman is about crossing that line, and murdering [someone]. I wanted to put Bruce into a situation if he was going to kill somebody, this was going to be the guy. To sort of see what he would do. And of course we know that he didn’t, because that’s who he is. Even though he’s compromised himself, he’s not willing to do that. So Alfred’s death would be the most challenging and the most rewarding thing for me to write. There’s a second Injustice game on the way and Tom Taylor will be writing a tie-in for that. And now we know there’s there’s going to be a direct adaptation of the first game, as well—that you were originally going to be a part of but had to move away from. Is this a universe you’d like you return to in the future, or are you ready to move on from it? Buccellato: Honestly, a little bit of both. I think because of my schedule and this writer’s fellowship that I have going on I had to walk away from Injustice. So I do feel like, partly, I’m walking away without finishing a job. So that’s kind of bittersweet. I’m really happy about my new opportunities but leaving behind Injustice is a little bit difficult. So, that said, I would be probably open to doing more Injustice down the road. It’s been a long road so far. There’s been a lot of chapters, a lot of writing, a lot of deadlines. And I think, you know, once I have a little distance I’ll probably want to get back to Injustice even more. The cover for Injustice: Ground Zero #1, by Ben Oliver. Looking back on your work on the series, what do you think is the most important thing you’ve learned, as a writer going through such a huge amount of story over several years? Buccellato: I guess it’s an appreciation for some of these characters that I never really thought about seriously before. Guys like Shazam, who I really like but never really got to write...or Harley, who’s the most fun character to write because she’s so unpredictable. I think the lesson I’m taking away from it is that there’s still a lot of ground in this universe that I still haven’t worked on. I guess it gave me a new appreciation for all that DC has done over the course of 75 years. The final chapters of Injustice are available now. Injustice: Ground Zero, the adaptation of the first Injustice video game, begins this October.